I obtained a brief tour of the Crown Vantage Paper Mill's powerhouse [many thanks to the guys working there near the end who let us in!] 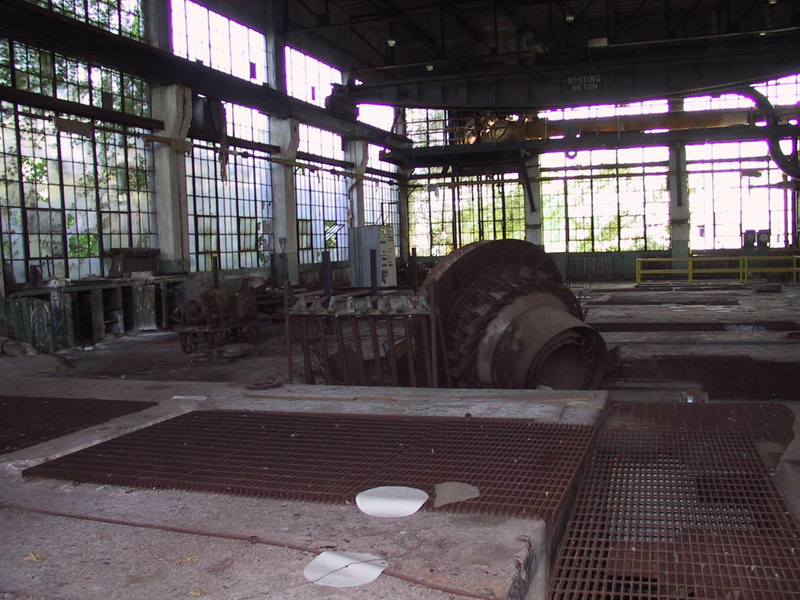 shortly before that plant permanently shut down, and judging from the amount of electrical panels and equipment in its turbine room, I suspect that in addition to the turbines, much switching and control equipment has been removed from this room as well. 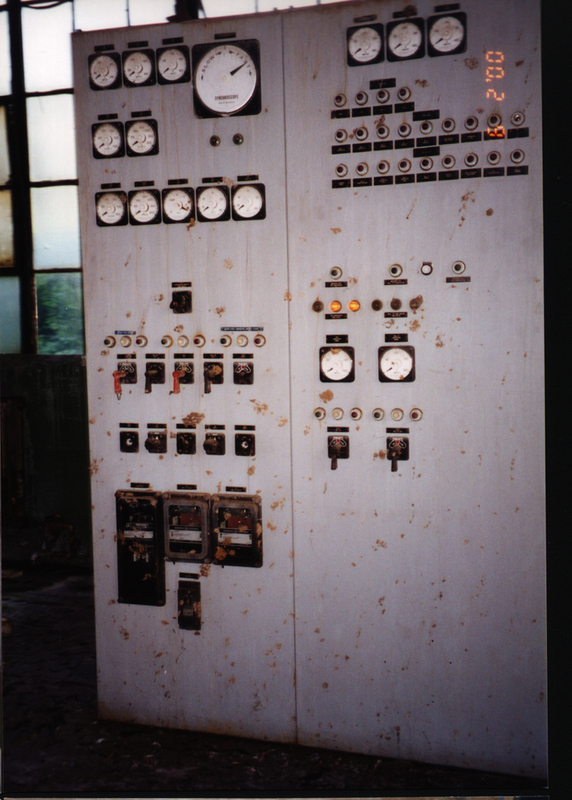 The single remaining electrical control panel (visible in the far corner of the first image, and detailed images below) was connected to the power grid on our earlier visits to the plant, as evidenced by the fact that some of its indicator lights were lit. 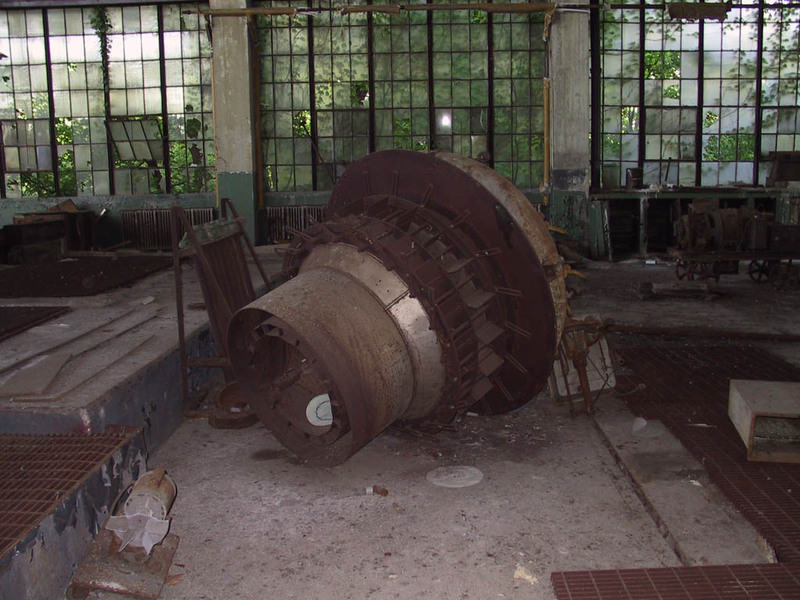 We've gone upstairs and are looking into what used to be the turbine room, when it still contained turbines. 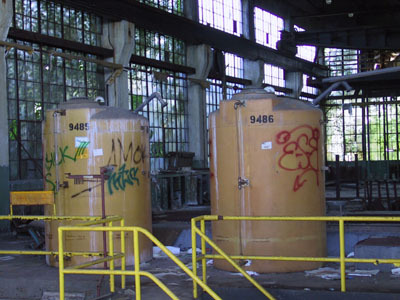 You can get a good view of the tops of those cylinders from up here. One really has to wonder exactly what those things did. 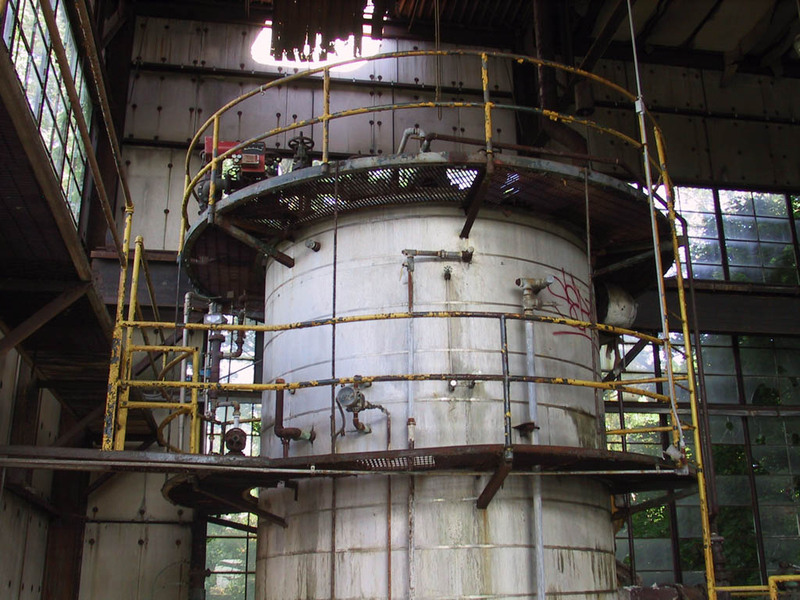 Some interesting chemical tanks exist up here. I wonder what was (or is) in them. There's a heavy piece of equipment. Perhaps it was part of a turbine at one point? Three large valves protrude from the floor! Gages and lights on a control panel in the corner of the room near the outdoor substation. 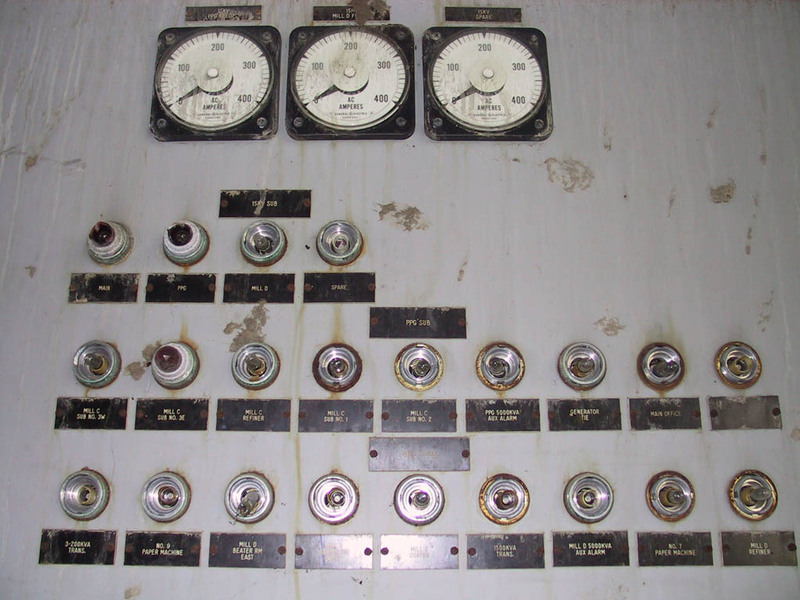 Some of the indicator lights on this panel were lit during one of our earlier visits. 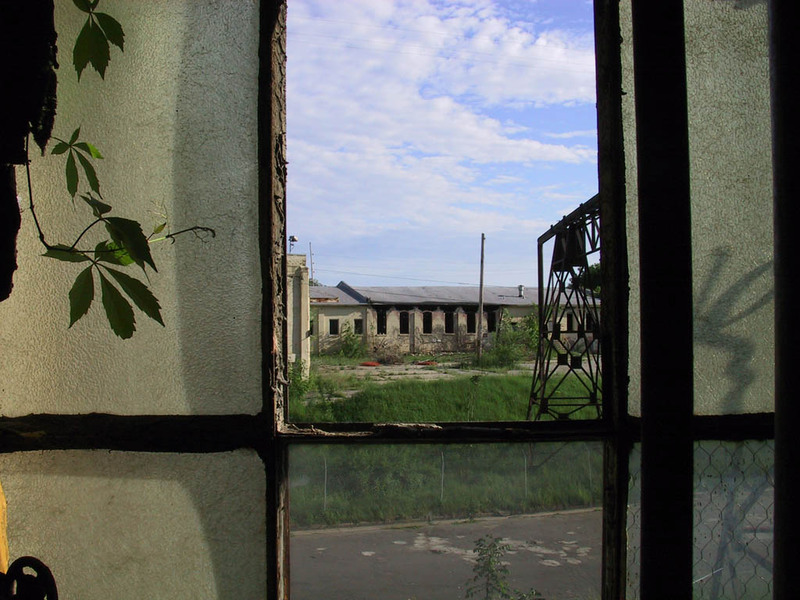 (This photo * shows the whole panel as of June 2000.) 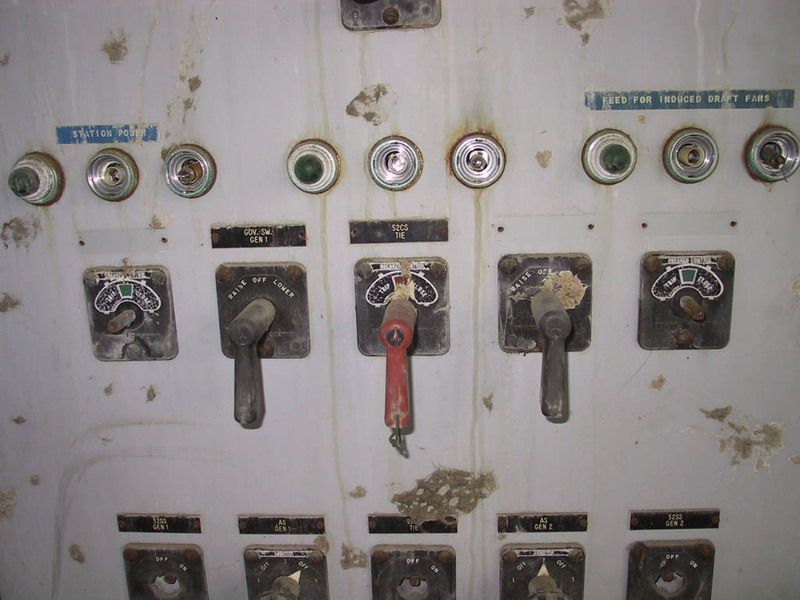 Now what I want to know, is whose idea of a good time is it to come into power plants and smash and/or steal indicator lightbulbs from panels as seems to have happened to many of the bulbs on this panel between the June 2000 photo and the current ones. I mean, the bulbs are tiny. It's not like they're even gonna make a big smashing noise, geez! Although I do know some people who might have been interested in stealing them, some of the fixtures definately look smashed up to me. The panel contains some switches, too. 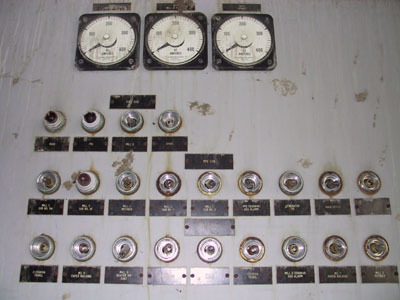 C. Demaine says that this panel was likely used to show and possibly control the mill's power utilization - if power started to fail or was coming up, you'd want to know what was running and what wasn't, so you could arrange to shed some load and prevent further outage. 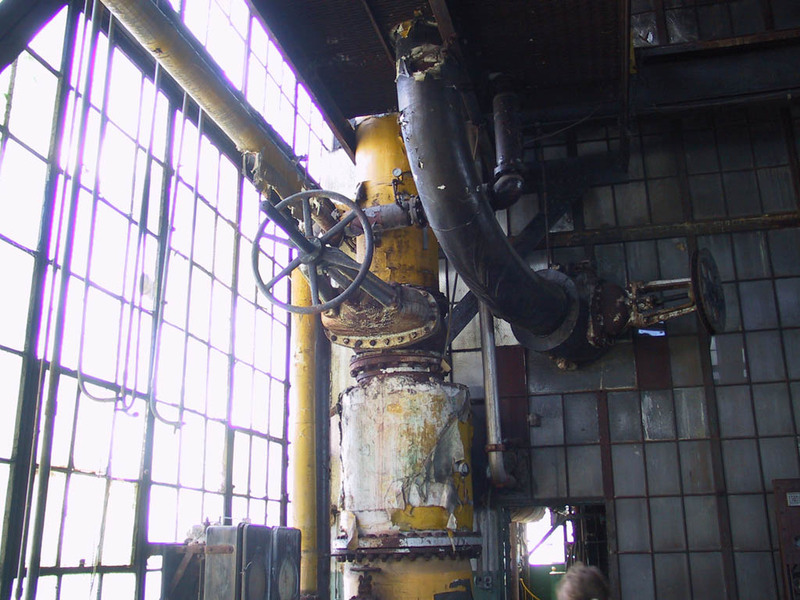 There goes another big steam pipe! 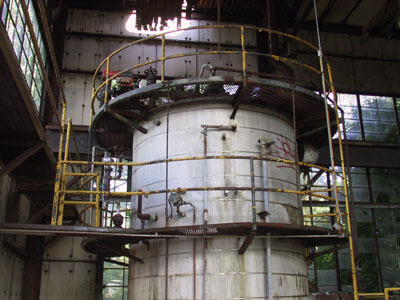 This one goes to Mill C through an overhead passage. Looking out the window near the steam pipe, one can see a section of Mill C which has been recently set afire. There is a status panel on the other side of the wall from one of the the boilers to tell you about various problems that could happen to the boiler, such as, "Furnace Draft", "Burner #1 (or 2) Flame Out", "Low Water Cutout", "Low Gas Pressure", "High Gas Pressure" (uh-oh! ), "High Oil Temp", "Low Oil Press", "Low Atom Steam Press. 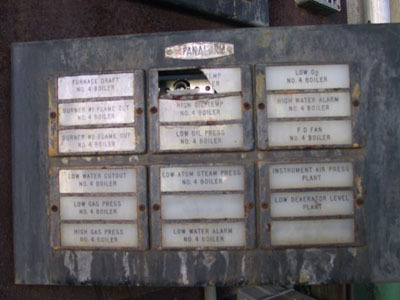 ", "Low Water Alarm", "Low Oxygen", "High Water Alarm", "F D Fan", "Instrument Air Press. 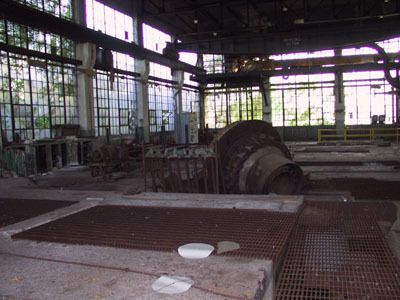 Plant", and "Low Deaerator Level Plant". 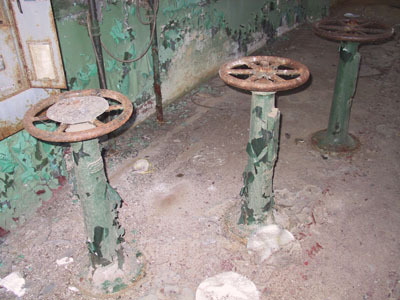 Proceed to the Boiler Room. Photographs marked with a * were generously supplied by S. Caron.